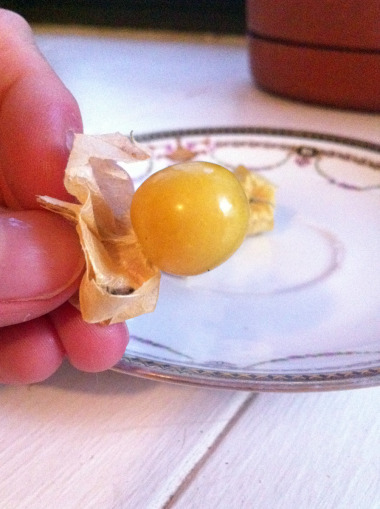 Like with a dream, I have no idea how my relationship with ground cherries began. Last summer, I found myself scrounging around in my bag at the Union Square greenmarket in NYC for spare change, laundry money, as much as I could pull together to purchase these intriguing fruits. I ended up with 5 pints and a homework assignment to figure out what the heck these things are and why they’re so hard to pin down flavorwise. 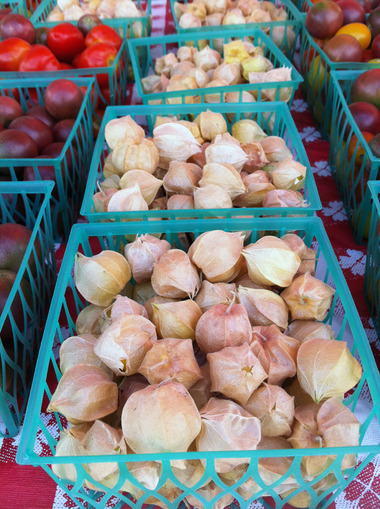 Ground cherries, also called cape gooseberries, belong to the same genus as tomatillos, the Physalis genus and they’re native to the Americas. Biting into one is an explosion in your mouth, the unlikely yet interesting flavor convergence of something like cantaloupe and blueberries. I once read somewhere that they’re traditionally dipped in chocolate, husks slicked back and served as dessert (maybe in Spain?). 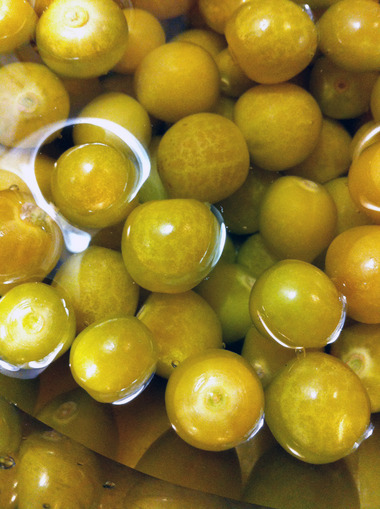 Then I found this fun blog with a post on just that, chocolate-dipped ground cherries. I, of course, made preserves. It’s worth noting that I sealed my micro-batch for shelf-storage so I could enjoy a little jar at various points throughout the year. You do not need to seal this size batch, as a pint of jam or two half-pints will keep in the fridge for at least 3 months. 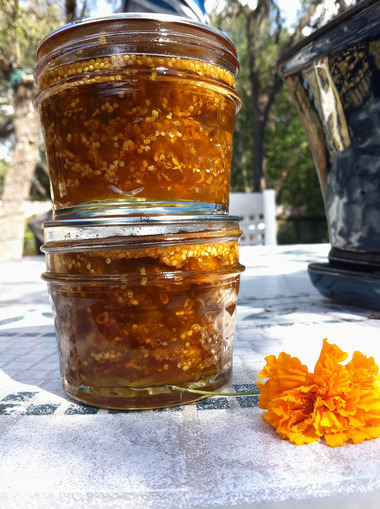 The recipe is safe for a waterbath; quarter-pint jars processed for 5 minutes or half-pint jars processed for 10 minutes. 2. Remove pot from heat once all sugar granules are dissolved, pour into a bowl and place in fridge with a piece of parchment paper and a plate to cover top of bowl. 3. The next day, pour the mixture back into your preserving pan and bring to a boil. It will take about 8-12 minutes for your preserves to set, depending on the type of pan you use and possibly the sugar. 4. 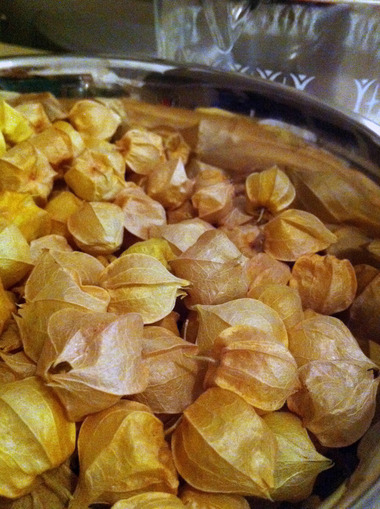 [optional] Mash some or all of the ground cherries with a potato masher to whatever consistency you prefer. I like to do this because it varies the consistency of the spread and pops out the seeds from about half of the berries. 5. Ladle hot preserves into hot jars and seal in waterbath (please refer to instructions for this in many of the other Canning & Home Food Preserving tagged posts) or ladle into one or two larger jars and place in the fridge; it will keep (if you don’t gobble it all up) anywhere between 3-6 months. This year I only managed to snag 3 pints. The farmer even gave me a dollar off, which whas sweet because she didn’t have to, since they’d all sell anyway and a 3-for deal wasn’t helping her out at all. Anyhow, I wanted to experiment with flavors despite the fact that I ended up with roughly half of last year’s batch. I made the recipe (halved all ingredients) as listed in steps 1-3 above, but just after mashing the fruit and determining a good set I tossed in a sprig of fresh thyme (from my garden! ), removed the pot from heat and let it steep (covered) for 5 minutes. After which point I added 1/4 teaspoon of Meyer limoncello to the spread and was pleased with the subtlety and mingling of the Meyer and thyme. I sealed my two quarter-pint jars, and proceeded to place them on the shelf where the only-opened-on-special-occasions jars go (which is not in the back yard). p.s. 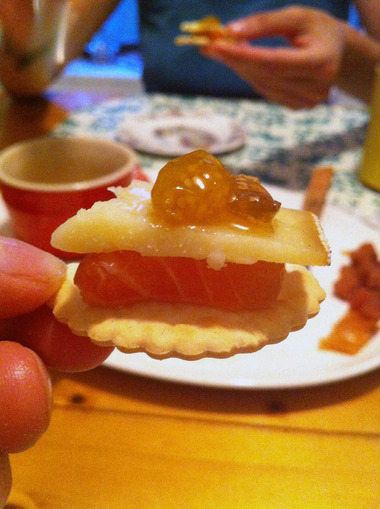 Italian Granny Ground Cherries Preserves are divine atop a spanish cheese and my recent food swap loot, gravlax!